Everybody has a personality! Coincidentally, everyone also has a favorite beer! Okay, maybe that isn’t a coincidence in itself, but to our knowledge, personality does correlate with beer taste. FireBrew Bar & Grill is known for not only our delicious menu, but also our large selection of beers. After serving people these beers for so long, we’ve begun to take notice of the types of people who purchased what. Here’s what we gathered, but please note, none of this is factual. Let us know how accurate our observations are! You’re a summer person, and winter doesn’t do for you. While everyone else is hoping for a white Christmas, you’re hoping for a sandy one. Most of the time, you’d rather drink saltwater than freshwater, even if it’s not exactly sustainable. Corona is the only thing that holds true to its sunny, beachy self while the rest of the world embraced fall and winter. Curse them! Summer is the only true season, and you can taste it whenever you open a bottle of Corona, stick a lime into it, and sip. You’ve just turned 21 and you don’t really understand beer. You’ve seen a Bud Light commercial, and the people in it seemed happy, so it must be a good drink, right? 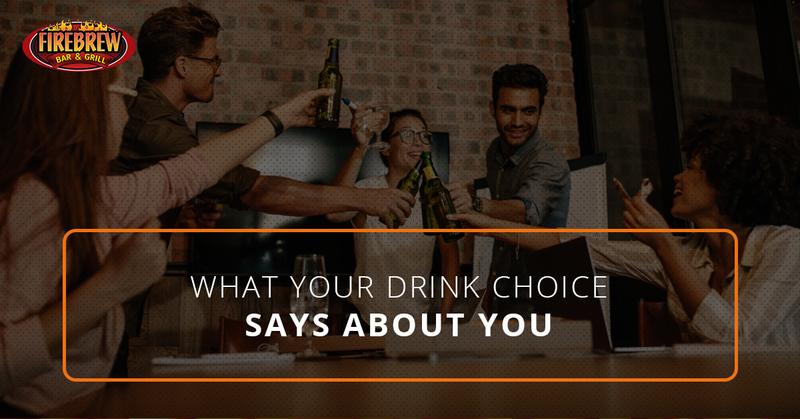 If you’re with some older people who have been able to legally drink for a while, you may experience looks that say, “are you sure that’s what you want?” but you may not understand. Soon, young grasshopper you will learn. Until then, “enjoy” your wate… we mean Bud Light. Stella is a fantastic beer, don’t get us wrong, but it’s for the snooty people. Formerly known as the beer that’s “reassuringly expensive” among other things in Britain, Stella is the perfect drink for those who think that they’re better than us ale and lager drinkers. Nothing against the beer, but we see right through you. Guy or girl, you probably have an overgrown beard and you’re wearing a flannel. It’s the only way that you could truly enjoy fall’s favored beer. Oktoberfest is delicious, but it’s not for the faint of heart. It calls for a hearty person to drink it. And that’s just fine! You don’t have to be a big burly man who cuts down trees for a living to be hearty, you just have to have a certain level of toughness in your soul. You’re into something a little bit sweeter. Additionally, you’re over normal ciders, and you’re into something different. The best options for you are often the ones that are a little bit different. Everyone else is in 2017, but you’re in 3017. It’s funner that way, anyway. You’re sweet, but you’ve got a kick. People who know you describe you as the “nicest person ever, but don’t get on their bad side…lol” We can appreciate these types of people. Regardless of your personality, we’re sure that you’ll enjoy our amazing beer selection! Next time you’ve got a hankering for a delicious beer to pair with your meal, come on down to our Virginia Beach restaurant! We’ve got a huge selection of tasty beers and meals to choose from, so come in today and we’ll serve you up the best meal you’ve had in awhile!